Check out what Godz Ov War has to say about this release below! “Godz Ov War Productions is proud to present Pora Umierać – a debut full-length album from the Poland’s old school black’n’heavy metallers TRUCHŁO STRZYGI. The commando, comprising still pretty young yet experienced musicians, have delivered 40 plus minutes of uncompromising and relentless, aggressive yet pretty melodic (the good way) black heavy metal with a punky vibe, drawing on the masterpieces of the old gods! 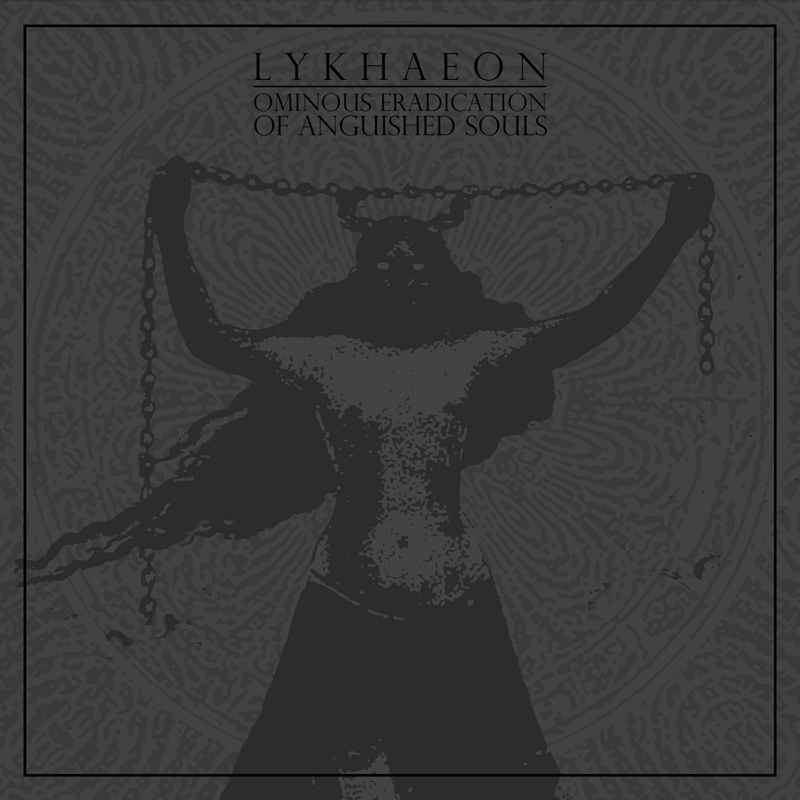 “Chthonic sounds of torment from below are about to devastate your senses again as LYKHAEON, the three-piece black metal act from Switzerland, are about to have their EP titled Ominous Eradication of Anguished Souls released on June 1, 2018 through Godz Ov War Productions. With black metal like riffs, howled vocals, an unmatched intensity and an overall sinister atmosphere, Urarv seem just like any other black metal band on the surface. However, that certainly is not the case as there is something that is different, unique and all around unsettling about them. Urarv are not black metal nor do they belong in any other sub genre of metal as they create a wicked, intense and grim sound all their own. They are harsh, punishing, atmospheric, schizophrenic in style as they never present you with the same sound twice even within one song. Urarv’s sound is eclectic, intriguing and ever twisting to present you with a sound that is all together odd yet gripping. Argentum begins with the opener Ahaman Inikak Mo, a track that is filled with didgeridoos and unsettling chanting arising from the ever blackening abyss. From there, Urarv roll onward in to their next track Krakekjott which stampedes out of hell right from the get go blasting you with that familiar cold black metal intensity. Kraketjott is probably the one track on this release that resembles what black metal traditionally is. Beyond this point, Urarv delve deeper in to their more experimental and mind bending side, taking you on an odd sonic journey through the wonderfully weird and unique soundscapes that they create. You can certainly expect the unexpected from Urarv as they never stick to one sound as they bounce around endlessly and tirelessly providing you with a sound that is hard to pin point. Each track is incredibly different from each other giving you an eternity of variety to listen to and listen for. Each listen will flesh out something new that you may not have heard before, and with each listen you will just want to continue listening. Through six tracks, Urarv snake and wind their way through excellently crafted tracks to gift you with an equally excellent and unique listen. Argentum constantly twists in directions that you may not have thought off throwing you for loop after loop. Once you feel as though you have it figured out, Urarv send you spiraling again keeping you guessing as to what you are about to be subject to. Argentum isn’t a normal record by any standards and that is exactly what makes it stand out. Argentum makes you feel unsettled as it lurches forth, twisting and writhing between its many sounds offering you something odd and intriguing to remember and revel in. Overall, Argentum is a great record as each track is wonderfully crafted and executed with solid musicianship, manic vocals and a raw production that brings everything together nicely. Argentum will be released through Svart Records June 1, 2018. In a great melancholic ode to death, sorrow and misery, Enclave of Dreams ushers forth their newest offering of melodic doom in the name of In A Captivity of Colourless Daydreams. Through this release these doom merchants pour forth seven brand new tracks of death riddled doom to shroud you in uncomfortable misery and grief. From the very beginning all the way through, Enclave of Dreams does a great job of pulling you in to their darkened world, shrouding you in grim melancholic atmospheres from which you can’t pull away from. This gloom laden release is sewn together with ever crushing riffs that are only to be supported by monstrous growls, forlorn clean sung vocals and ever present sorrow filled ambiance. Each of the seven passages within this offering are slower burning odes to suffering and grief as each track takes you hand only to lead you down ever darkening corridors. In A Captivity of Colourless Daydreams is a weighty record that really makes its presence known right from the onset, never giving you enough time to escape to the light and take a breather. Enclave of Dreams unravels their despondent brand of doom right before you making you feel heavy, stripping you away of your hope of ever seeing bright light again. Through In A Captivity of Colourless Daydreams, each depressive passage hits you square in the chest making you feel all of the emotion that has been poured in to each second of each track. For seven total tracks Enclave of Dreams pushes forth gripping tight to your sorrows and grief only to drag you down to a never ending world of darkness. There isn’t an uplifting spirit that you can find within this release as Enclave of Dreams trudges forth in slow burning fashion plunging further and further in to the abyss. Not only do the atmospheric tendencies pull you further in to the dark world that Enclave of Dreams creates, but the ever melodious near hypnotizing musicianship grabs a hold of you as well. Each track is melodic and mesmerizing never making you want to waver and pull away from the listen. Enclave of Dreams pours seven well knit together, well performed, well crafted and incredibly atmospheric and melodic tracks through your speakers and in to your gnarled ears only to poison your mind with heavy, doom riddled, forlorn thoughts. Right off the bat, Enclave of Dreams catches your attention never to let it go until the final dissonant note has rang through. Through and through, In A Captivity of Colourless Daydreams is a very solid record, one that you can sit and listen to in solitude for some time without tiring of it easily. With everything being said, In A Captivity of Colourless Daydreams is a solid record and a great listen overall. To kick this split off between CHRCH and Fister is the brand new track from CHRCH titled Temples. This seventeen minute opening track begins with a melancholic intro that not only is melancholic but serene in a way, until you hit near the four minute mark. Around this four minute mark you become swallowed up in a wall of monstrous reverberating riffs, pounding drums and devilish shrieking vocals. From here on in you are provided with nothing but captivating, dark, twisted and ultimately bone splintering doom. Temples trudges along with the intent of dragging you along with it down a dark and twisting corridor to your ultimate demise. CHRCH create an ever looming and dark atmosphere within these seventeen minutes; one that follows you the entire length of the track. Temples is a wonderfully malevolent piece that does a great job of captivating and mesmerizing you from the drop of the first note. With longer tracks you tend to wonder if the listen will be a burden or longer than it should be, but that certainly is not the case with Temples. Even at seventeen minutes this track flies by because you become so wrapped up and involved with the track. This is a wonderfully crafted piece by CHRCH, one that you will have a hard time forgetting. Immediately following Temples is Fister’s The Ditch. The Ditch is a great follow up to Temples as it is just as grueling and twisted. From the get go, Fister greets you with throat shredding screeches, low, slow and murky riffs that are accompanied by the ever present pounding of drums. The Ditch is a dissonant and monolithic assault on the listeners ears as you are provided with nothing but harsh doom for twenty plus minutes. Around the eight minute mark is when you can breath again as Fister presents you with a calm, nearly serene break in the action until the track builds back up and finally pushes you back down in to the dark depths of despair with more trudging and life ending doom. Even as oppressive as this track is and even with its lengthy run time, you still sit and listen all the way through marching in syncopation with the drum beats to your doom. Much like Temples from CHRCH, The Ditch is just as an enthralling listen as much as it is a damning one. With dissonant soul shredding riffs paired with hammering drums and vocals that range the spectrum from high pitched shrieks to rabid larynx shredding lows, you are gifted with a harrowing, punishing and ultimately entertaining and heavy listen. The Ditch is a cohesive and well constructed track that slowly drives you to madness, but even so you will find yourself playing this track over and over. The pairing of CHRCH and Fister on this split is great and utter madness. Each band compliments the other very well providing you with an all around great listen. Each track has a ton to offer, and while this split may seem daunting, it is definitely worth listening to all the way through. This is a great release to say the least, and you certainly cannot go wrong here. This split will be released November 17, 2017.